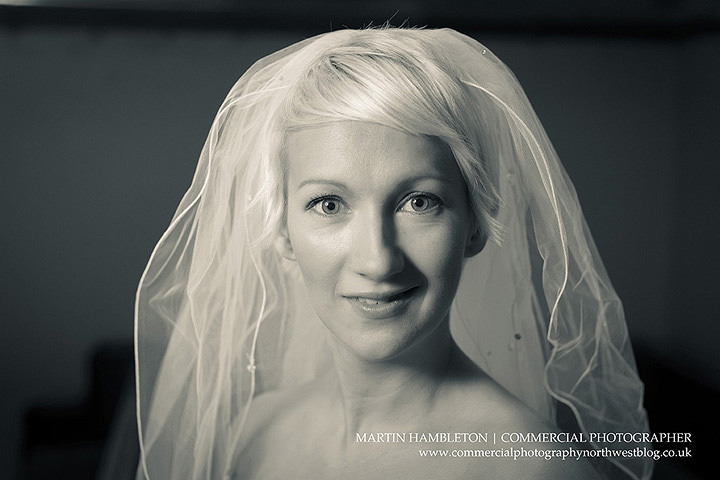 Beauty and bridal portraits - photographing brides ... again .. I photographed Kate’s wedding three years ago – on the day of the Royal Wedding in fact. It was a great day out in the Lake District. We’ve kept in touch since (what did we do before Facebook? Well, write letters I suppose ..) and recently had a conversation where Kate said she’d love to put her wedding dress back on and have more photos done. It’s a common point made by a lot of brides – after the excitement of the big day, the wedding dress gets packed away and rarely seen again. Certainly, it never gets worn. She’d seen a shot (on Facebook, of course) of the back of a bride’s dress, lit from behind and wondered if I’d be interested in creating something similar for her? Of course, I was delighted to say yes to this. But rather than just turn it into a simple portrait session and recreate someone else’s image, I thought we could make it a bit more interesting. I got us permission to shoot in the private chapel at Arley Hall (where, curiously, I’ve never shot a wedding ceremony despite having shot dozens of weddings at the Hall). The light in churches is usually wonderful for photography – a mixture of hard direct light through the windows (often coloured by the stained glass) and the shadows created by the mass of brickwork, dark wood, pews and so on. A lot can be done with that contrast, while the drama of the setting lends itself to dramatic portraiture. The session was split into two parts. In the first, we shot environmental portraits, incorporating the great location to create images that were a little fashion influenced, as well as creating a version of the shot that had inspired the entire commission. These were about using the chapel to lend drama, and showing off the dress. And in the second part I concentrated on closer head and shoulders portraits. Here, I was looking to create soft images, in fitting with the idea of bridal beauty. I also wanted to make images that were essentially dark, with the sitter emerging from the darkness. I’ve been looking a lot recently at some of the images created by two of the greats of fashion and portrait photography, Richard Avedon and Irving Penn and wanted to create something in that vein during this session. Two things stand out about their work – the simplicity of the images themselves (the attention is very much on the person, with little else in the frame), and the gentleness of the lighting. If you’re interested, I was using a single beauty dish, located just off camera and to the left. It creates a beautiful pool of soft, flattering light, and can also be limited to lighting just the subject, as here. I think it’s a lovely effect and one I’ll work much more with. Many thanks for Kate – I’m so glad we had the conversation about making more portraits. Because of the success and enjoyment of this shoot, I’m now offering this service to all the brides whose weddings I’ve shot in the past, and will shoot in the future.